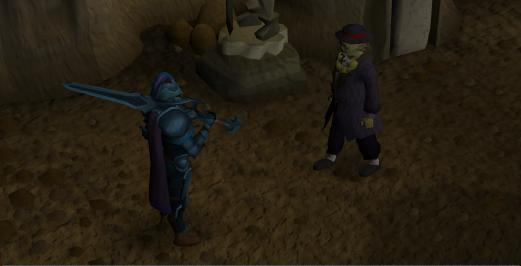 Begin by speaking with Sir Tiffy Cashien in Falador Park. 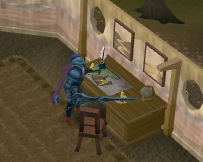 He will inform you that your process to enter the Temple Knights is complete, and that he will give you a new mission, in Ardougne. He will tell you to report to Colonel O'Niall. He will give you a secret code in order to speak to him. He will also update your Commorb. If you do not have one, Tiffy will give you another. Either way, you'll get a Commorb V.2. This is a map that could be useful if you have trouble finding some people during the quest. 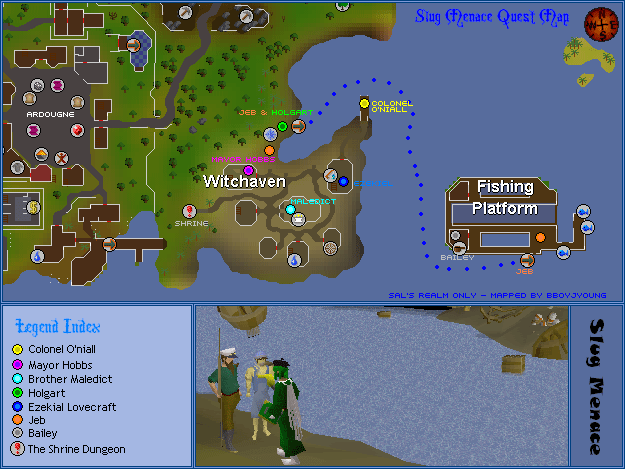 Witchaven is located east of Ardougne. Go find Colonel O'Niall. Begin by talking with him, and he will tell you that some odd things are happening in town. Ask him every possible option, and go on to the next step. He will tell you to go speak to the following 3 people:Mayor Hobbs, Brother Maledict and Fisherman Holgart. Begin by speaking with Mayor Hobbs. Something is fishy about him! Ask him everything you can. 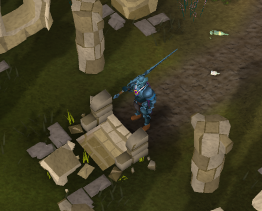 He will tell you about a Shrine to Saradomin, and he will ask you why you are there. After you are done speaking with him, Savant will contact you on your Commorb. She will tell you that he definitely sounds weird, and she will ask you to scan him. Scan him with your Commorb, and she will tell you that there are 2 life forms emanating from him. Head to Brother Maledict. Once again, ask him everything you can. He will tell you that most villagers have been changing in the last few weeks, and that Mayor Hobbs is renovating the old, untouched Shrine. Go speak with Holgart, from the fishing platform quest. He will tell you he cannot sail anymore, since the Mayor made some new sailing laws, and that because of that his boat was taken from him. Once you have successfully spoken with all three of them, head back to Colonel O'Niall. He will tell you to investigate the Shrine next. Go to the bank and grab some food and armor if needed. The Shrine is actually the dungeon from the Family Crest Quest, and it is located west of Witchaven. Go down inside. In the first area where there are some hobgoblins, there should be a secret wall to push on the east side. Push and it go through. You should be in some kind of tunnel with aggressive, level 40 Giant Lobsters! There is also an agility shortcut you can use to save time. You don't need to fight them. 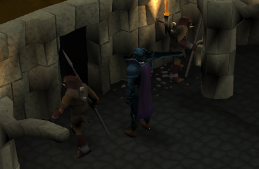 Make your way through the tunnel until you reach some strange doors with 2 big temple knight statues. You will see some sea slugs coming out of the door, and you will also find a Dead Sea slug. Pick it up, Keep it, and Savant will contact you. She will be worried when you pick it up, but it is dead. Now, go near the Big Doors and scan it. She will tell you that the markings are some quite familiar saradominist transcript. She will give you a Note of the Door Transcription. You will now be directed to take this to Jorral. Jorral is located between North West-Ardougne and the Gnome Stronghold, to the east of Arandar Pass, in a small structure. He is the main character from Making History Quest. Jorral will translate the text. As you speak to him, he will think that you are speaking to yourself. Savant will contact you and she will tell you what to tell to him. He will tell you about a battle between saradominists and a strange evil creature. Once that is finished, Savant will contact you again, and she will inform you that the Mother Mallum is behind all this, and she will also brief you shortly on her. Go back to Witchaven. Speak with Colonel O'Niall again, and he will point you out to go speak to Brother Maledict. As you head to the church, you will be interrupted by a strange cutscene. 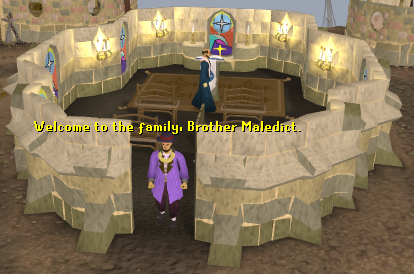 Someone will exit the church and say "Welcome to the family, brother Maledict!". Speak to him again. Strangely enough, he his no longer himself and will act oddly. He will say things such as "We are maledict". Ask him about the Shrine, and he will inform you that the history book pages have been stolen. Time to search for the pages of the book! You will need to find 3 pages. 1. The first page is on Mayor Hobb's Desk Downstairs. 2. Speak with Ezekiel Lovecraft from the Fishing shop for the second page. When you speak to Colonel O'Niall, you will notice that his beard has turned white... and his skin yellow! He has been corrupted! When you have the torn page, you will wonder if swamp paste might do the trick. When you try using swamp paste on it, Savant will stop you. She will tell you that you must not use swamp paste on that page, and you should use the dead Sea Slug glue on it, but you will need to find someone with years of experience in seafood cooking. Once you have all your pages, you are ready to do the next step. You must craft some specially shaped runes. 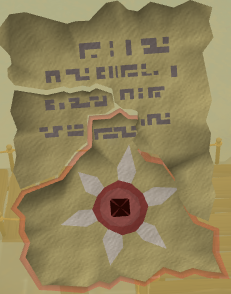 This may fail sometimes, so make sure you make extra blank runes. Use the Shape - Air, Earth, Water, Fire & Mind Options from the pages by right clicking on them. 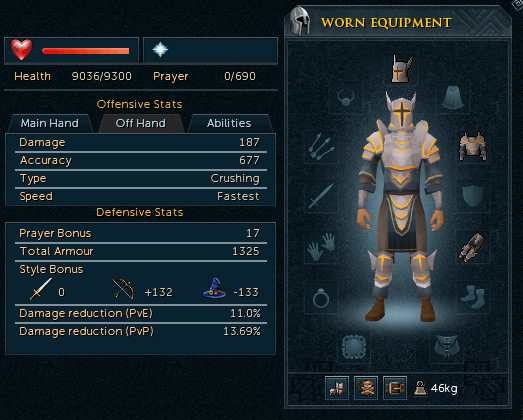 You must have your chisel in your inventory as well as Rune Essences. This should give you a Shaped Blank Rune. This may fail. These shaped runes must them be empowered at the appropriate altars. Empowering them may fail and destroy the shaped runes. You should get Enchanted Shaped Runes. Once you have them all, go back to the Shrine doors. Before you go, Grab your Melee combat gear and some food. Go back all the way to the Shrine doors, Place your shaped runes, and the doors should open. You will be interrupted by a short cutscene and you will see Mayor Hobbs. You will have a brief conversation with him. They couldn't open the doors that kept Mother Mallum in. They needed someone connected with the Temple Knights to open it for them... You've been set up! He will send the Sea Slug Prince after you! You will have to beat the Slug Prince. He is not that hard and he is level 51 and has 3700 Life Points. 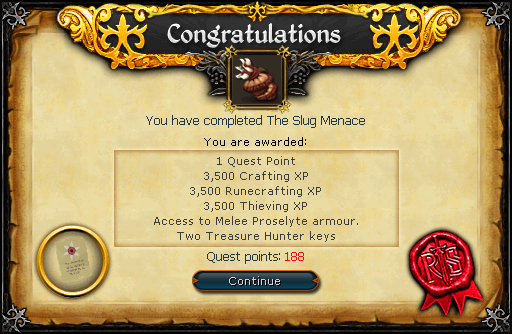 Note: The Slug Prince can only be defeated with melee attacks. It's the Mother Mallum! She will come towards you! She will try to take possession of you, and Savant will try teleporting you. The Mother Mallum will try to teleblock you! After a short moment, you will be teleported to Falador park. 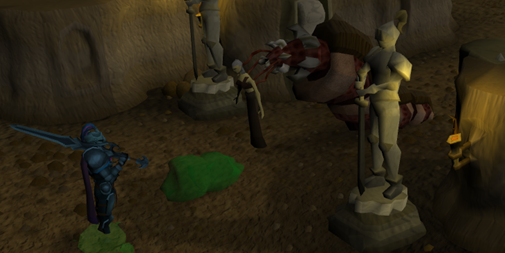 Speak with Sir Tiffy Cashien and inform him of the events to finish the quest. 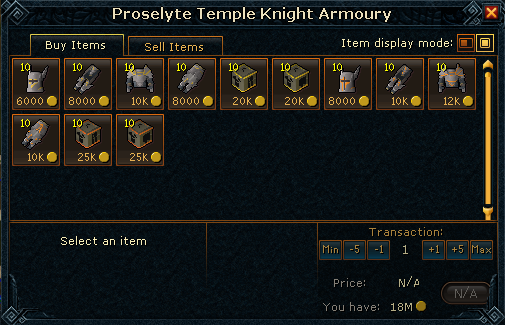 Proselyte armor is for higher ranked temple knights. Although it looks like initiate armor, this armor provides far more better bonuses than the initiate armor.